Family Bibles on display, Harford Community College. Julia Ciccio. 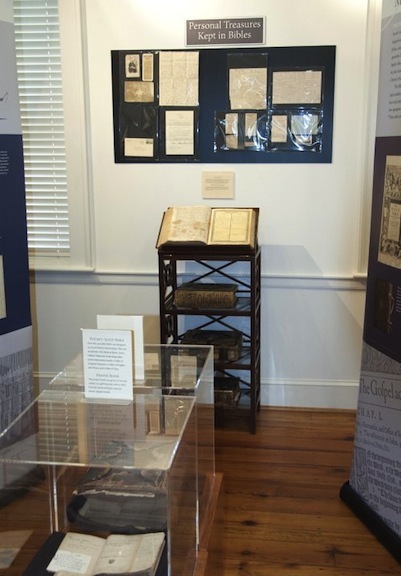 To augment our exhibit at the Hays-Heighe House at Harford Community College, we borrowed several 19th-century Bibles from the Harford County Historical Society. These were the oversized and gilded Bibles with tooled leather covers—incredible specimens. Along with the Bibles came the contents. As the Manifold Greatness exhibit mentions, many families store personal keepsakes such as letters, pamphlets, prayers, obituaries, and other items in their heirloom Bibles. 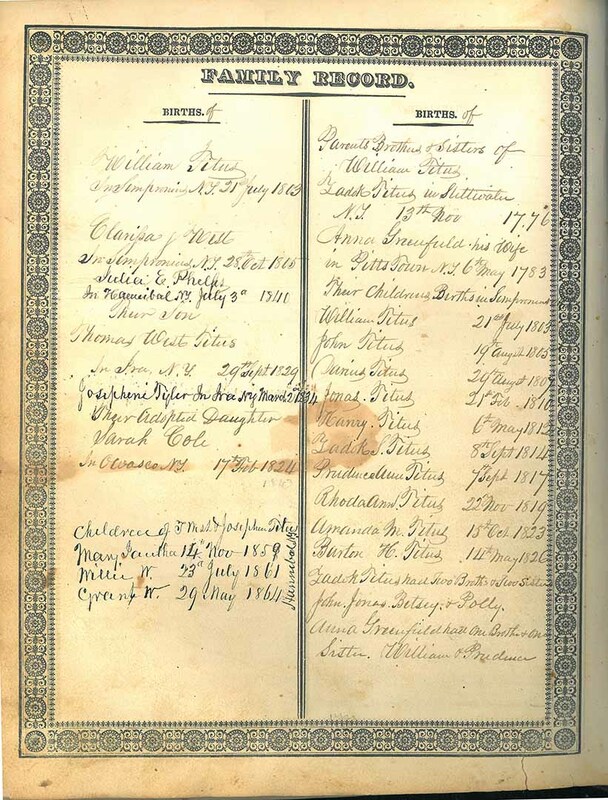 One Bible we borrowed maintained a family record of the Titus family as far back as 1776. It also contained several interesting keepsakes. 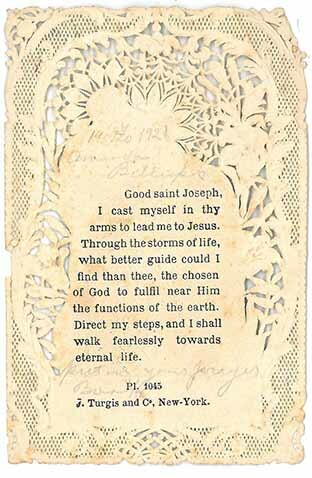 The photos here include a family record page, an obituary bookmark, and a prayer to “Good Saint Joseph” with a detailed reproduction of an etching mounted to intricate die-cut lace paper. The handwriting is beautiful on the family record page and the keepsakes were fascinating. Iris Barnes is the Coordinator for the Hays-Heighe House, site of the current Manifold Greatness exhibit at Harford Community College, Bel Air, Maryland. For more information, consult Family Bibles on the Manifold Greatness website. This entry was posted on May 13, 2013 by manifoldgreatness. 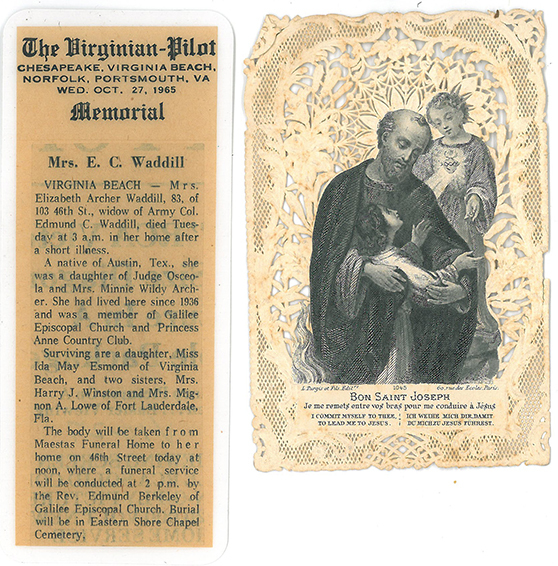 It was filed under On Tour and was tagged with exhibit, family Bible, family history, Harford Community College, Hays-Heighe House, Historical Society of Harford County, keepsakes, obituary, Saint Joseph, Titus family.